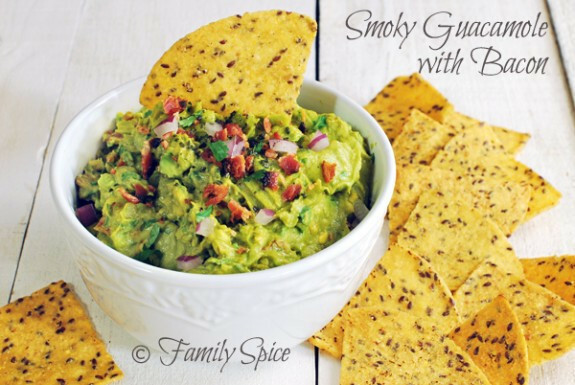 Cold smoke your avocado and you have the perfect game-day dip! Recipe and photos courtesy of Family Spice. Heat a non-stick skillet over medium-high heat and add bacon strips. Cook bacon until crisp, about 3 minutes. Turn over and cook other side, about 2 minutes. When completely cooked, remove from heat and place bacon strips on a folded paper towel to drain. While bacon cools, dice avocado into 1/2 inch cubes. Crumble cooked bacon strips. Place avocado and bacon in a large mixing bowl along with red onion, cilantro, garlic clove, serrano chile, lime juice, paprika and black sea salt. Cover bowl with a lid or plastic wrap and place tube of the PolyScience Smoking Gun™ under the plastic and into the bowl. Turn on the PolyScience Smoking Gun™and light the wood chips. When chips are all burned and bowl is filled with smoke, remove tube and completely seal the bowl. Let smoke sit for 5 minutes and then remove the cover. Coarsely mash the ingredients together and serve immediately. You never quite answer the question by Donna What was the best chips to use for the above receipe? What would be a couple of wood flavors to try? I’ve made this dip several times and it’s always a hit with our friends. It’s also simple to make!